Description: KCS 1908 leads sisters 1906 and 1920 westbound along the former Union Staiton grounds. 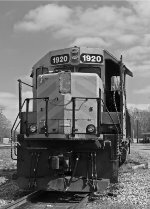 Description: KCS GP38-2 1920 rests at the sand tower in downtown Monroe. Description: Two units tied down outside of High Oak Yard. Description: A rough looking 1920 sets outside of High Oak yard. Description: KCS 1920 TIED DOWN AND TO A COVERED HOPPER AT THE KCS YARD IN MARIDIAN MISS. Description: KCS 1920 SITTS TIED DOWN AT THE KCS YARD.